What is the MSP challenge board game and how can it best be used? What are practical examples of the use of the MSP Challenge board game? Why use the MSP Challenge board game instead of the digital MSP Challenge? The first MSP challenge board game was developed in 2011. The Ministry of Infrastructure and the Environment in the Netherlands and the NHTV University of Breda found the need to explain MSP and the different uses in the sea in a more interesting way to stakeholders. After this first version, the board game evolved and changed according to the needs of the institutions using it. It has also been used in projects such as North SEE, SIMCelt and Baltic Lines projects to explore various scenarios. Increase the understanding of the different maritime uses accounted for in MSP and how they can be in conflict with each other. Workshops on playing the board game differ, based on the requirements of the client or project. In general, the board game is used for a session of about 1 to 2 hours with an audience who have shallow understanding of Maritime Spatial Planning. Often, participants are divided into smaller groups, responsible for or a) specific sea use or b) for a specific part of the board, called a region. A Game Overall Director (GOD), who is a MSP policy expert, acts as the one who directs the set-up of the game, directs the scenario of the game and establishes whether the objectives of the game is being reached. Different scenarios can be invented to test particular aspects of MSP. Eg. Working towards ensuring sustainable development, the installation of offshore renewable energy infrastructure or tourism opportunities. Depending on the scenarios and number of participants being considered as part of the game, some strategic roles are shared among participants e.g. shipper, maritime spatial planner, offshore wind developer, nature conservation advisor, fisher etc. The MSP Challenge board game is practical and can be used for smaller workshops to introduce participants or ‘gamers’ about the challenges and conflicts in MSP. The developers of the MSP Challenge Board Game have also developed the MSP Challenge 2050 computer simulation game which is more suitable for ‘gamers’ with more advanced knowledge of MSP. The computer simulation game is a more advanced and technology based and requires a workshop of at least a day to understand and actually draw a maritime spatial plan and see the possible consequences of the fictitious plan on other sea uses (such as the environment). While the board game uses a ‘fictive area’, the computer simulation game uses the Baltic Sea or North Sea as area, however can refer to it as ‘the sea of colours’. The board game and the computer simulation game thereby target a different audience and have a different goal. The board game has been used more than 20 times during stakeholders or MSP related meetings. There are also several versions of the board game available, not only at NHTV (the developer), but also at several other universities and MSP Authorities. 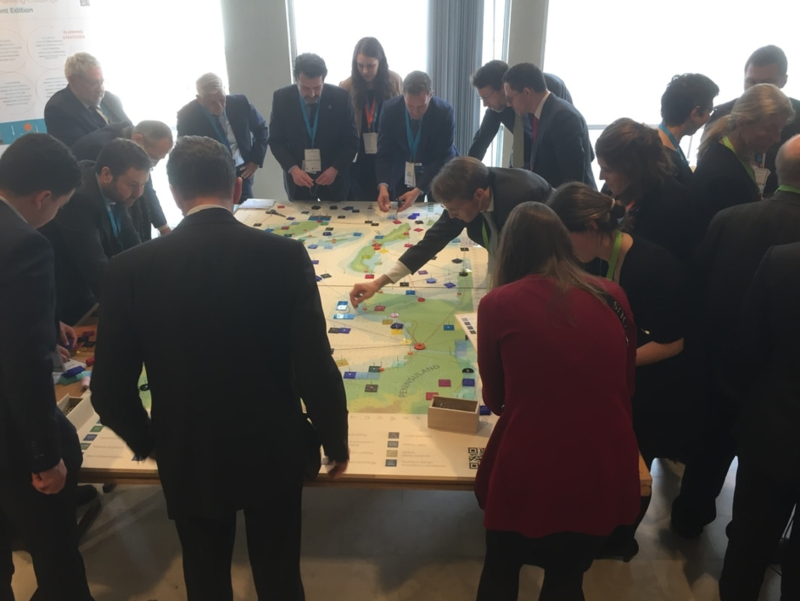 Examples of workshops where the board game has been used are the 2nd International Conference on Marine/Maritime Spatial Planning, taking place in Paris in 2017, where several participants joined, such as the EU commissioner Vella. Also, in national MSP processes the board game has been used to raise awareness of sectoral stakeholders for other sea uses. An example is the starting event of the revision of the Belgium MSP on the 8th of February 2017. Around 130 professionals played on five supersized game boards, learning how to make use of and protect the marine environment. The playful approach to planning was uniquely covered on Belgium television the same evening. As part of the SIMCelt project, the MSP Challenge approach was introduced into the Clyde regional MSP process and the Statement of Public Participation in Scotland. Stakeholder engagement workshops using the game were run around the Clyde Marine Region with participants and stakeholder who had minimal experience in MSP to raise awareness about MSP which can support the development of the regional MSP. The MSP Challenge Board Game is a highly transferable tool which can be applied anywhere around the world. While the sea space of the board is fictive, it does not create limitations for using it. Many different versions of the board game are already available, and it is more the workshop concept itself, which determines the outcome of a session, instead of the tool. Many board games are around. They have mainly been funded by governmental authorities and some have been funded partly by EU funded projects. Abspoel, L., Mayer, I., Keijser, X., Warmelink, H., Fairgrieve, R., Ripken, M., ... & Kidd, S. (2019). Communicating Maritime Spatial Planning: The MSP Challenge approach. Marine Policy. Keijser, Xander & Ripken, Malena & Warmelink, Harald & Abspoel, Lodewijk & Fairgrieve, Rhona & Mayer, Igor. (2018). Maritime Spatial Planning – A Board Game for Stakeholder Involvement. 58-66. 10.1007/978-3-319-91902-7_6.